Liechtenstein is the 6th smallest country in the world, larger than San Marino but smaller than the Marshall Islands, and is roughly twice the size of the island of Manhattan. The Principality is ruled by a stable royal family that is so popular that when in 2002 a referendum was put to the people to increase the executive power of the prince, including giving him the right to dissolve Parliament, it passed by a 64% margin. Snuggled in between Austria and Switzerland, it enjoys a prosperous existence, profiting from a close cooperation with the Swiss, whose money they use via a currency union. Liechtenstein also participates in EFTA, the little-known “other” free trade area in Europe. Like the Swiss, the principality is in the EEA, and they have a treaty of defense so they don’t have to have their own army, as the Swiss have promised assistance as needed with their own forces. The citizens are taught high German (the kind spoken in Bern and Berlin) in school but speak their own dialect known as Alemannic which is shared by (unsurprisingly) Swiss Germans and parts of southern Germany and Austria. I had a chance to visit this lovely country last month and spent a day cycling along the Rhine, which forms part of the border of the country. 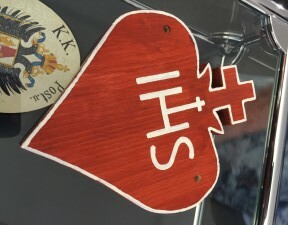 I got to dip in and out of the border towns in Switzerland and Austria, and found myself, in the waning afternoon hours, back in the capital city of Vaduz, and in their Postal Museum where I was examining their large and historical collection of stamps. 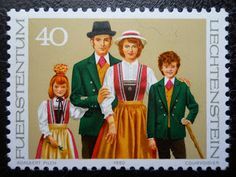 My nieces and nephews, all under the age of 12, might not understand the excitement I had at their age upon beholding a stamp from a faraway land, and in times in which we still wrote thoughts on paper, folded them up, and commended them to the magic of the post office, stamps from Liechtenstein and other tiny places were a special treasure. As I looked in the gift shop on my way out of the museum my eyes came upon this. I had heard about this item earlier in the week, but I wanted to clarify my facts with the ladies working at the museum. The cows come back in September and they are led by the cow that produced the most milk over the summer. 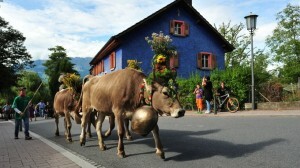 That cow wears a very elaborate headpiece made up of a milk stool decorated with alpine flowers. All the other cows wear the heart above, known as the Alpabfahrtsherz. It bears the IHS in thanksgiving to He who has preserved the cows and kept them during this time. 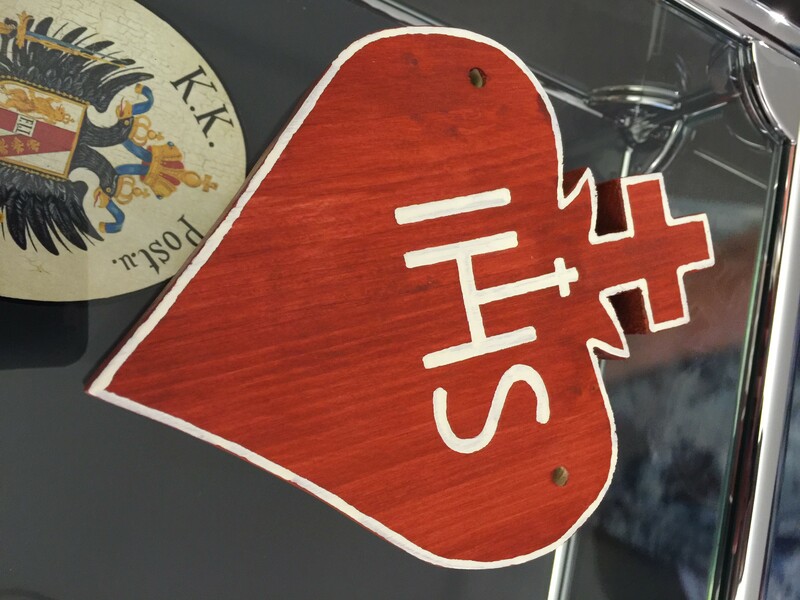 When they come back to their home property the hearts are removed and affixed to the side of the barn. These used to be individually made, but as herds have grown in size (and machines have made the process easier) they have become standardized. 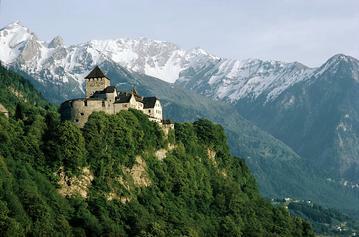 Liechtenstein is not the easiest country to get to, as it has no public airport or rail service. However, efficient and clean buses service the entire country from 5am to roughly 2am, and those buses also run to Switzerland (Sargans and Buchs) and Austria (Feldkirch) which you can easily reach by rail. This summer we’ve heard all about how disastrous Brexit will be, and so it’s heartening to visit a place that doesn’t let land mass or purely economic concerns dictate its destiny. Its denizens have long held that heresy despised by the apostles of free trade: small is (still) beautiful. Hmm. Sounds lovely, but I’m not quite sure what lessons we can draw from them. Very small, very homogeneous, physically geographically isolated, tax policy designed to attract massive amounts of foreign corporations to locate there. It’s not like their stratospheric per capita GDP is due to cheese or anything local or sustainable in any way. Well I didn’t mention their GDP, but yes, offshore businesses account for 30% of its revenue. But I see that as smart policy designed to attract those who don’t want to pay absurd tax rates. I wouldn’t characterize less than 100,000 companies as “massive,” but there it is.